A parent is their child’s #1 healthcare advocate. By educating yourself about scoliosis and other common child conditions, you can keep kids healthy. Watch these videos now. If you think you have poor posture and/or hunchback posture, here is a way to help fix it. Watch Now. Oscar is seventeen years old and has played soccer since four. Soccer is the number two leader in concussions, so its no surprise that he may have had some injuries in the past. Watch Now. Oscar’s x-ray analysis helps explained how Chiropractic was successful in his recovery and preventing future re-injuries as he continues to play soccer. Watch Now. “Through regular adjustments, following Dr. Tony’s videos on stretching & strengthening exercises…I’m now completely off all the drugs feeling healthy, & happy.” Read her full testimonial. Medication misuse…The blame has been put on the patient in the past, and now the national medical association is seeing their fault. Watch Now. After the accident the pain became almost unbearable pain during all physical movement. Difficulty walking, sleeping, and constant headaches. Medications were not working. Watch Now. Usually a weak, painful back can be correlated with tight hamstrings (located behind your upper legs). 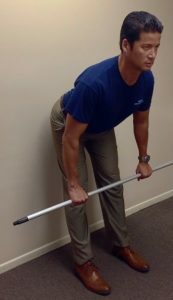 This exercise with help relax your hamstrings BEFORE starting back strength exercises. Watch Now. How does Poor Posture Stress Your Body? 19th: Parent Scoliosis Education In-Office workshop: 10-11AM. RSVP encouraged. Handouts included.